I received free products in order to host the National Mom’s Nite Out party. The opinions expressed here are my own. As Moms do you ever get an evening to relax and reconnect with friends, socialize, and enjoy some well-deserved girl time? Oftentimes we don’t take the time to relax even for a few hours by ourselves or with girlfriends. A Mom’s Night Out party is the perfect way to have fun with your favorite gal pals and enjoy a night out… or in. You can easily create an unforgettable experience with these mom’s night out party ideas. I wanted to do something that was relaxing where we could have fun chatting for a few hours. I thought the perfect thing would be to have a mom’s night in and watch the Moms’ Night Out DVD. I kept it very simple and laid back. You don’t have to spend a lot of money to make it fun! I used MyPrintly to print out custom decorations, signs, popcorn bags, wine charm labels, etc. They offer new ideas, tips and tools so you can create unique and personalized projects. They also offer video tutorials. It is an amazing site! I am hooked! Another great tip is to offer games or diy projects for your guests. I had Bicycle playing cards available and a station for guests to decorate wine glasses. For DIY wine glasses, I suggest buying a box of wine glasses, craft paint, and other craft items. This is a cheap way to keep guests entertained. It’s fun to see the ideas everyone comes up for their own glass. Be sure the wine glasses dry before they grab their wine glasses. One of my guests had a bit too much of our signature cocktails, grabbed her wine glass and it was still wet! I wanted to create my own Signature Mom’s Night Out Cocktail for all my favorite girls. 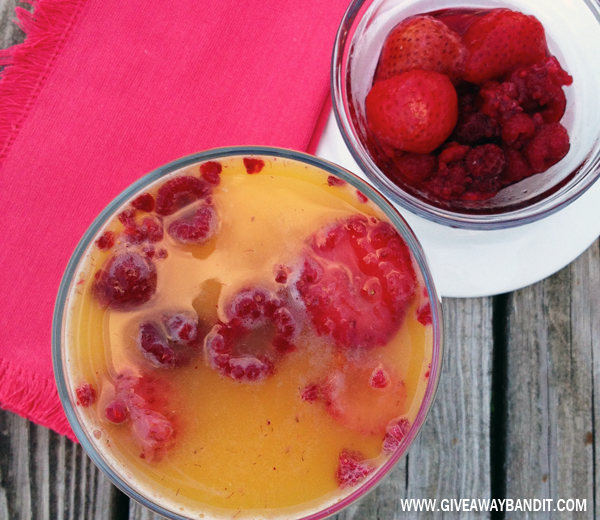 Get the recipe for our Raspberry Strawberry Fruit Infused Mimosa. Get creative with your drinks. If you offer an alcoholic drink be sure to also offer something non-alcoholic for friends driving themselves home or those that don’t drink. I also had some delicious Daily’s frozen pouches available. One pouch filled about two glasses so be sure you have plenty on hand. They are so yummy! Just stick them in the freezer for 8 hours before you’re party so they are ready! I also offered a good selection of finger foods. I kept it pretty lazy with a few on-the-go snack items like Entenmann’s Little Bites chocolate chip mini muffins, Pepperidge Farm cookies (Oh my gosh they are delicious! ), Cheez-Its and Chex Mix. I tried to make them look a little more elegant on my table. haha! My table did get a little full! I offered some delicious fried chicken sliders with Asiago cheese, ranch dressing, tomato and lettuce on a mini bun. I also made the most scrumptious sauteed asparagus with garlic atop prosciutto and mozzarella on a whole grain cocktail bread crostini. And don’t forget the popcorn! I printed these cute popcorn boxes at MyPrintly.com, cut them out, folded and taped them to hold my popcorn. I popped a quick bag of popcorn, drizzled with dark chocolate and sweet hot sprinkles. They are too cute! I made my Mom’s Night Out party into a movie night. We really enjoyed watching Moms’ Night Out on DVD. If you haven’t seen it, it is a must see for your whole family! It’s a fast-paced, family comedy about four moms scheduling a night out where everything can and will go wrong, yet it all turns out just fine in the end. Remember when I got to hang out with the celebrity moms of ABC? Patricia Heaton was one of them and she is in the Moms’ Night Out movie. She is absolutely amazing! Or, you could watch something you wouldn’t watch with your kids, if you’re gal pals are very adventurous, like Fifty Shades of Grey! Have you ever hosted a Mom’s Night Out party? If so, share your details with us! I like the DIY wine glasses. Wonderful idea for wine lovers. Yes, I agree! It was a lot of fun! You can get really creative with them too! I like the frozen drink pouches. I’ve tried them a couple of times. On a hot summer night they hit the spot. I love the wine decorating glasses thing 🙂 It’s so easy! Those little popcorn boxes are cute. I like all of your suggestions here and I’m so overdue for a mom’s night out!